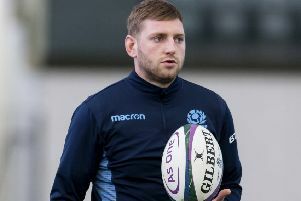 Ryan Wilson is hoping to be back on the pitch contributing to the Scotland cause against Wales on Saturday rather than stuck on the couch “screaming mindless stuff” at the television. After playing a key role in the opening Six Nations win over Ireland, the Glasgow back-rower was ruled out of the second game against France in Paris with an infected elbow and he admitted he is not the most relaxed spectator. Ryan Wilson looks sure to return for Scotland against Wales at Murrayfield. The 27-year-old reported that he is fully recovered from the unfortunate condition which scuppered his chances of appearing in the 22-16 defeat at Stade de France. “I couldn’t have played last week as I had an infection in the blood called cellulitis,” he explained. “It was not something that would have got other people ill but I was suffering from it all week. The doc was not happy. “I got a cut on my arm, banged my forearm and the bug got in through the cut and the bleeding inside spread really quickly. I woke up the next morning with a pretty swollen elbow. I could not recover from it. Following the loss of Josh Strauss, pictured, to a kidney injury picked up in that brutal contest in Paris which also saw skipper Greig Laidlaw’s Six Nations brought to a premature end, Wilson is almost certain to return to the back-row when Vern Cotter names his team today, most likely at No 8 in place of his injured Glasgow team-mate. “From my point of view I am happy playing anywhere in the back row, 6, 7 or 8. Six and No 8 are very similar. There is not a huge amount of difference. Josh is a great player when he gets going forward. He can carry ball very well and when you need someone to inject a bit of oomph and go forward –from the lineout, for example – he is the man to go to. “If I have to step up I am happy to carry the ball and we have plenty of players in the back row who can take that responsibility. You have seen Hamish Watson. You have seen him wriggle out of tackles in the last two games. Barcs [John Barclay] is a good carrier, and you have [John] Hardie, similar to big Straussy in that he is a big ball carrier, abrasive. Cotter is clearly a fan of Wilson and the feeling is mutual, with 15 of his 24 Scotland caps coming during the Kiwi’s time in charge, which will come to a close at the end of the Six Nations. “My relationship is good with Vern. I get on with him,” said Wilson. “When it comes down to rugby he wants someone who works hard in my position and I am fine with that. I am happy working under Vern. Every coach you work under adds a bit to your game. Gregor [Townsend] has done a lot and Vern has brought different aspects to my game. Wales have retained the back-row that started their 21-16 loss to England in Cardiff, with Sam Warburton, Justin Tipuric and Ross Moriarty backed up by 63 times-capped No 8 Taulupe Faletau from the bench. “When you play at club level you have to target them as they will be quick on ball,” said Wilson of Saturday’s opponents. “We have to be quick to the breakdown. Moriarty has come through and has had some brilliant games and is an effective ball carrier and tackler. Scotland will be looking to end a miserable run of nine straight defeats to the men in red and Wilson insists that, despite that woeful record, there is no mental block. “They have players spread across the four teams in the Pro12 and we play against their players week in and week out with Glasgow and Edinburgh. We know their players quite well.